Did Jesus die for us so we could party? Maybe he did. Street artist Zombie’s iconic ‘Future Jesus’ can be found throughout Los Angeles donning stylish party shades and he thinks so. But religious statement? Not so much, more of a reminder that although life gets serious, there is always a party to be had. Zombie’s images, paired with his unconventional, daring and creative placements, are aimed at transforming the daily ho-hum of life via a visual reminder of a time when we were a bit younger, when we took things a bit less serious, and simply having fun was a whole lot important. The ‘Future Jesus’ is just one in a long line of inventive imagery he emblazons upon LA streets to get this message across. You can simply step outside and see a myriad of good times: his ‘Skinny Jeans’ paste, his ‘Crazy Mel,’ and the stylish ‘Disco Jesus’ in a suit. When asked about his art, he reflects, “It fuels my inner child; it gives me an opportunity to be creative and express myself in a way more understandable to my peers.” The whole city, not just Zombie’s peer group, is now listening to his message. One would think the name ‘Zombie’ came from an affection for brain hungry creatures. The reality is he doesn’t have strong feelings either way for the cult phenomenon. 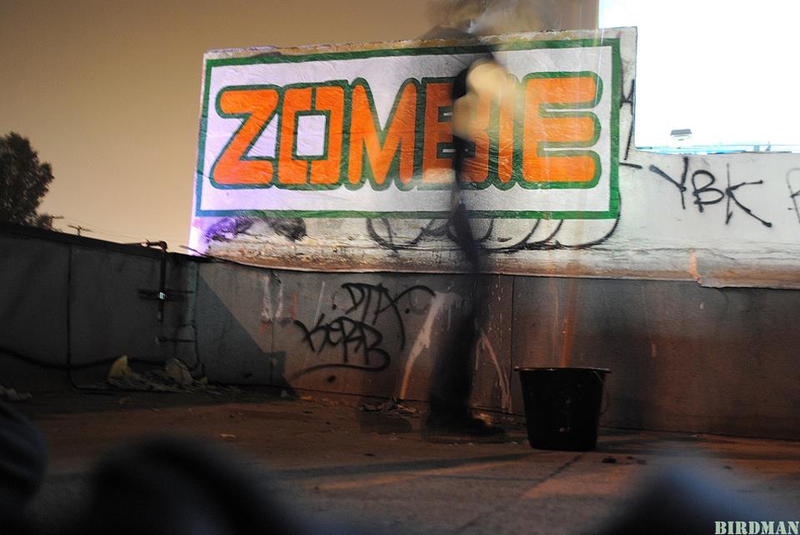 Rather, ‘Zombie’ is a descriptor of how the artist feels while cruising the streets at night – hungry for the next perfect spot, living in a world uninhabited by ‘normal folk,’ a creature of the night. Instead of feeding on your brain, this Zombie is giving your brain something to feast on by leaving his images on the street with a paste bucket and a brush. Whether he is going big or placing smaller images at street level, his at placement is obvious and he never fails to ensure his pieces interact with the environment surrounding it. He takes into consideration “the right colors, the right size, and the perfect placement. We’re not just throwing things together …We’re really thinking about things.” This deliberate planning process and attention to detail is what separates talented street artists from the others. Sometimes you can see a Zombie piece from one block away and sometimes they sneak up on you, but the quality of work always lets you know it’s his.